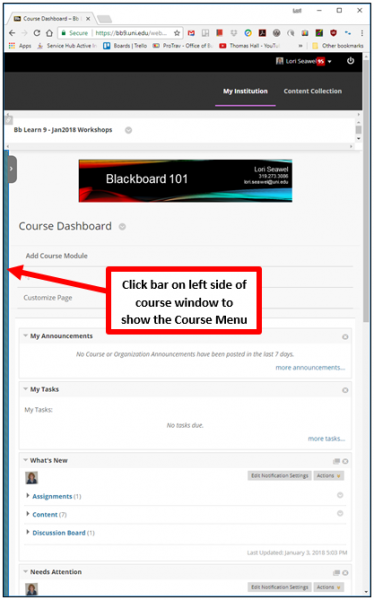 Blackboard now utilizes responsive design, delivering a more consistent experience when accessing courses on any device. 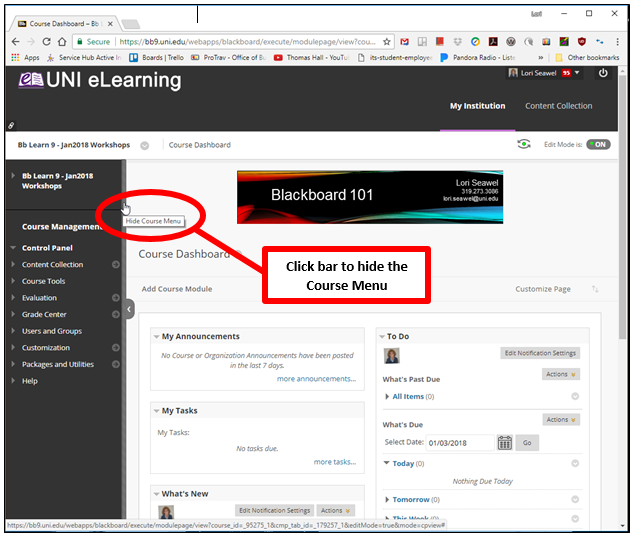 When users log in to Blackboard Learn on a mobile device, a tablet, or even on a computer using a small browser window, the course menu collapses on the left-side of the screen, giving priority to the course material displayed to the right. Additionally, content elements change position, adjusting to a vertical flow to limit horizontal scrolling. As the screen gets smaller, modules and tool tiles stack so the user still has easy access to them. This is a feature of Blackboard’s responsive web design that occurs when the browser window is opened at 1024 pixels wide or less. Please see the image below for an example. Compare this to the second image of the exact same course page lower on this page of instructions. The layout is simply different because of responsive design. If you need to access items on the Course Menu, you simply need to open the Course Menu. To show a hidden Course Menu, while in the course, click any point on the vertical bar along the left side of the browser window. In a similar manner, should you wish to hide the menu to gain more screen space for the page content, click any point on the bar which appears when hovering between the Course Menu and the rest of the page content. See the image below. Using zoom magnification in your browser (Control and + keys) may cause the Course Menu to collapse and/or cause the page elements to reposition in the same way as described above. You can simply open the Course Menu when needed. To make page elements readjust back to the regular layout, it is necessary to use Zoom magnification to zoom out again (Control and – keys).